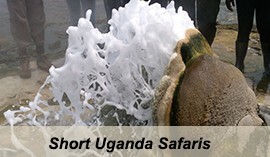 5 Days Uganda Gorilla Trekking Tour. 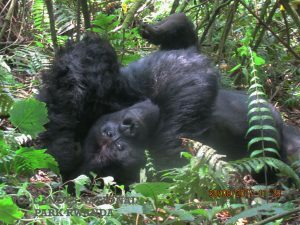 Gorilla Tour Uganda. 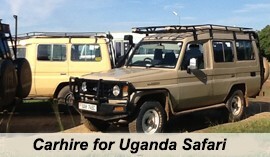 Wildlife safari in Uganda. This is a 5 Days Uganda Gorilla Safari taking you Gorilla trekking in Uganda Bwindi Impenetrable National Park plus a Queen Elizabeth National Park wildlife safari in Uganda. The 5 Days Uganda Gorilla Trekking Tour & wildlife safari takes you through Bwindi Impenetrable National Park and Queen Elizabeth National Park. It involves trekking gorillas in Bwindi and viewing wild game in Queen Elizabeth. The critically endangered mountain gorillas that are endemic to only three countries in the whole world with Uganda having the highest count of them, makes it justifiable to undertake gorilla trekking experience in Bwindi. The blend of scenery in the crater area and the wild game including the tree climbing lions, antelopes, leopard, buffalo, elephant among others enriches your 5 days Uganda gorilla and wildlife safari. Day 3 of the 5 Days Uganda Gorilla Trekking Tour & wildlife safari: Transfer to Queen Elizabeth National Park & do crater drive. 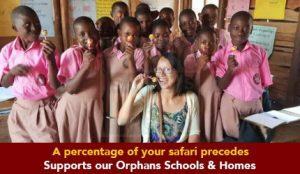 Day 5 of the 5 Days Uganda Gorilla Trekking Tour & wildlife safari: Transfer to Kampala. 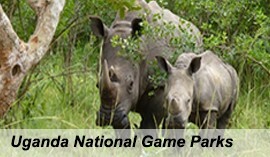 After breakfast transfer to Queen Elizabeth National Park – the highest visited Game Park in Uganda. You will pass through Ishasha sector where you have chances of spotting tree climbing lions lying on the tree branches in the midmorning sun. In the afternoon, you can do a crater area drive and pay a visit to the salt lake to have a great scenic view of the explosion craters which by failure to have outlets have turned to be salt lakes. Retire for overnight. Wake up for an early morning 3 – 4 hour game drive though the Kasenyi tracks where you will have chances of viewing a range of wildlife. Some of these include; lions, elephants, Buffaloes, Antelopes, jackals, among others. You will marvel at them as they gather what to put in their stomachs and others taking a rest. The savannah landscape in which they thrive is an attraction in its self. Return to the lodge for relaxation till lunch time after which you will gather at Mweya for a launch cruise on Kazinga channel at 3:00pm. The 2 hour launch cruise takes you through the offers of the 45m long Kazinga channel including impressive views of the Nile crocodiles, Hippos, abundant bird life and a range of wild game quenching their thirst along the channel waters. 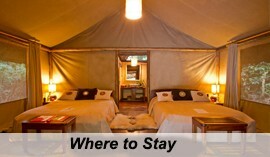 Return to the lodge for relaxation and overnight. After breakfast, embark on the return journey to Kampala. You will make a stop at Igongo cultural center 12km past Mbarara for lunch. You can also visit the cultural museum and the 1520 AD eclipse monument before continuing to Kampala to mark the end of your safari tour.